The Back Jack is excellent for those who get lower back pain when sitting or if you just need a little additional support for for your back when sitting longer periods of time. The Back Jack acts like a beach chair but with far more padding, strength and durability in the design. Cotton duck cover and foam pad seating. Supremely comfortable transportation to your favorite inner destination! The Back Jack is excellent for those who get lower back pain when sitting or if you just need a little additional support for for your back when sitting longer periods of time. The Back Jack acts like a beach chair but with far more padding, strength and durability in the design. 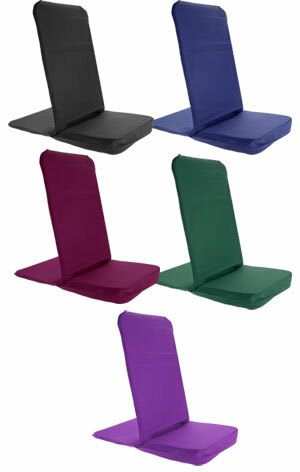 BackJacks are excellent for meditation retreats, at home, at the park, the beach, camping or elsewhere. Use it at home, for meditation and meetings, or pack it up and take it with you anywhere! Some veteran meditators customize the Backjack chair by adding their own favorite cushions. Cotton duck cover and foam pad seating. Stocked in purple, black, burgundy, navy blue and forest green. I got the back jack last year as a gift, and it has been great to use. Due to lower back pain, most of my sitting meditation was hard. But with the back jack I stay sitting in a comfortable position for many hours. This is a great purchase.